Sign up to newsletter. Engines & Engines Parts. Windscreen Wipers & Washers. Read the product description and compatibility tables. And we can double check what part will fit your car. 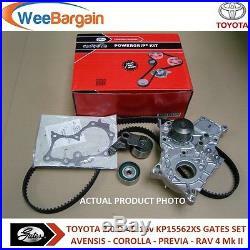 TOYOTA 2.0 D-4D 16v 2.0 D Engines GATES KP15562XS Timing/Cam Belt & Water Pump. AVENSIS and COROLLA incl. VERSO also PREVIA RAV4 MK II. GATES SET – OE QUALITY WITHOUT COMPROMISE. BEST AND MOST COMPLETE REPAIR SOLUTION. AVOID COMEBACKS BY REPLACING CRITICAL SYSTEM COMPONENTS AT THE SAME TIME. NEW GENUINE GATES SET. Timing/Cam Belt Kit with Water Pump GATES KP15562XS. For TOYOTA 2.0 D-4D 16v DIESEL Engines. Verso – Corolla incl. Verso – Previa – RAV4 MK II. 1x GATES Powergrip® Timing Belt 5562XS. 1x GATES Tensioner Pulley T41280. 1x GATES Guide Pulley T42192. 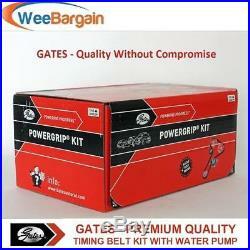 1x GATES Water Pump WP0073. PRODUCTION AND EQUIPMENT RESTRICTIONS APPLY – FOR FURTHER GUIDANCE. PLEASE CONSULT VEHICLE COMPATIBILITY TABLE BELOW. PLEASE NOTE: The Vehicle Compatibility Tables Above and Below Should Be Used As A Guide Only! On Occasions There Might Be More Than One Option Available For Some Vehicles. Please note that we will only despatch your item(s) once we have received cleared funds. They will send you either a text. If this is not convenient, you can instruct them to deliver on a different day or to a different address (a neighbour or a post office). All deliveries made by Parcel Force will require a signature. On top of the tracking, RM will send you either a text. If the parcel remains uncollected, a further message is sent to remind you that we are holding it. List of Out of Zones. Channel Islands – All GY & JE postcodes. Isle Of Man – All IM postcodes. Scilly Islands – Postcodes TR21-TR25. Scottish Highlands – All HS, IV, KW, KA, PA, PH & ZE. Aberdeenshire – All AB postcodes. Northern Ireland – All BT postcodes. Any damages must be reported to us within 24 hours for us to raise a claim with our courier. Any claims after 24 hours will be dismissed for a claim. We reply to all messages within 24 hours. VAUXHALL VECTRA C 1.9 CDTi 150BHP Z19DTH GATES TIMING BELT WATER PUMP KIT 24H. VAUXHALL INSIGNIA 2.0 CDTi FULL GATES KP35623XS-1 Timing Belt and Water Pump Kit. AUDI A3 A4 VW Golf Passat 1.9 2.0 TDI 8v KP55569XS-1 Timing Belt Kit Water Pump. AUDI VW SEAT SKODA 1.4 1.9 TDI 2.0 SDI 8v KP55569XS-2 Timing Belt Kit Water Pump. VAUXHALL VECTRA C 1.9 CDTi 120BHP GATES KP25650XS Timing Belt Kit Water Pump. PEUGEOT 206 207 307 308 407 1.6 HDi GATES KP15598XS Timing Belt Water Pump Kit. Get the latest offers directly to your inbox! 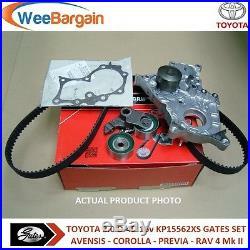 The item “TOYOTA 2.0 D-4D 16v 2.0 D Engines GATES KP15562XS Timing/Cam Belt & Water Pump” is in sale since Thursday, February 18, 2016. This item is in the category “Vehicle Parts & Accessories\Car Parts\Engines & Engine Parts\Belt, Pulley & Tensioner Kits”. The seller is “wee-bargain” and is located in Whitburn, West Lothian. This item can be shipped to United Kingdom, Ireland, Germany, France, Greece, Italy, Spain, Austria, Belgium, Bulgaria, Croatia, Cyprus, Czech republic, Denmark, Estonia, Finland, Hungary, Latvia, Lithuania, Luxembourg, Malta, Netherlands, Poland, Portugal, Romania, Slovakia, Slovenia, Sweden, Saudi arabia, South africa, United arab emirates, Ukraine, Chile.